BeetBox asks users to ‘Bring It’, challenging the inevitability of a poor eating experience when bringing lunch from home or taking away from a café or salad bar. BeetBox encourages product re-use, minimising waste, and encourages positive attitude and every-day wellbeing. BeetBox’s design challenge was to offer inspiration, excitement and a quality eating experience in a mundane product category, while retaining fit-for-purpose functionality and exceeding the functionality of existing products. Existing plastic containers and lunch-boxes stain easily, crack and their seals wear out prematurely. Existing glass containers are heavy or feature bulky, cumbersome clips and sealing mechanisms that are prone to damage and collecting grime. BeetBox had to combine desired material choices while not impacting its usability in terms of sealing function, weight, flexibility, longevity, replaceable parts & cost. BeetBox provides an innovative solution to these challenges. 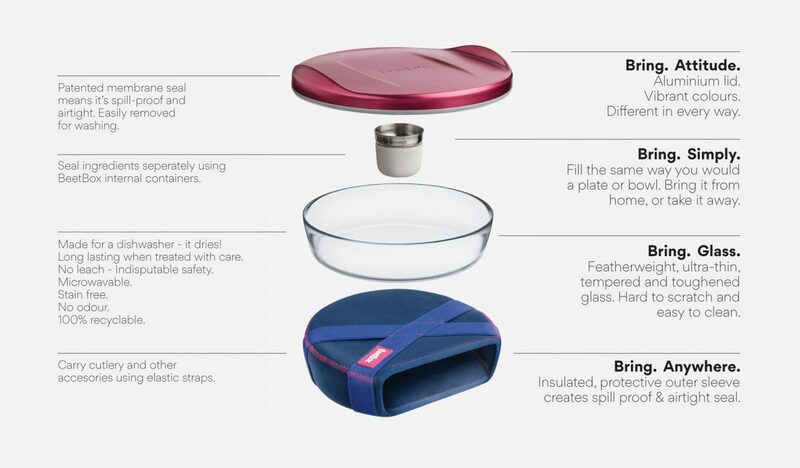 A superior eating and carrying experience provided by a pure shaped, featherweight, toughened Glass Bowl. Hard to scratch, easy clean, stain free, odorless, no leach - indisputably safe. It’s like eating out of a bowl at home. BeetBox’s unique patent-pending Membrane provides a liquid-tight seal, with no mechanical clips or features. The Membrane also seals internal divider containers separately from the main bowl, while allowing one or more to be positioned anywhere inside. The neoprene outer-sleeve holds BeetBox sealed together, while insulating, protecting and providing additional stowage. 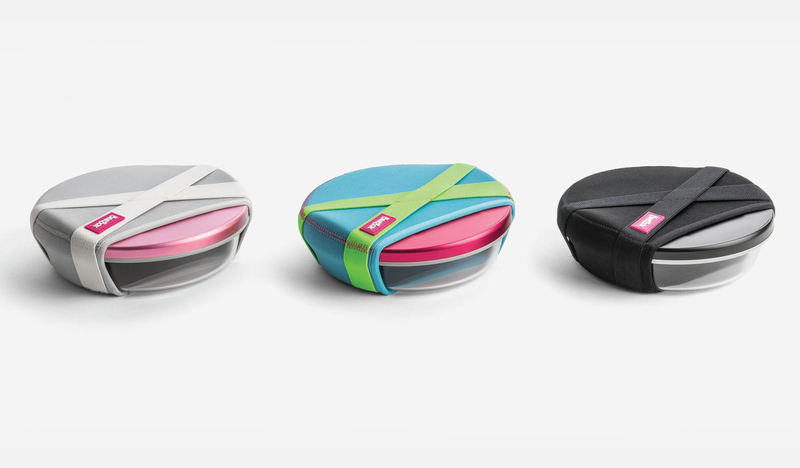 A tactile, anodised aluminium lid and bold colours ensure a lovable product. BeetBox champions positive attitude & everyday wellbeing at work, while striving to eliminate food packaging waste through re-use. Re-use being exceptionally more efficient, and better for the environment than recycling. Designed with dual purpose; to fill at home or use with take away. BeetBox provides a simple inspired solution to fill at home, reducing domestic food waste while making lunch that is good for your health, the environment & your wallet. BeetBox can also be used as a substitute for single use disposable containers enhancing the enjoyment & sustainability of lunch from your local restaurant. We ask our users to “Bring it.” And we don’t just mean in the physical sense. We always wanted BeetBox to be more than its function. To feel so good to use, you’d use it more. Designed more like a fashion product than a homeware, BeetBox empowers users to make the most of lunch on their own terms. Key functional benefits: 2) 1) Heart of glass (Glass Bowl) - Premium material, better for environment and safety than plastic. Manufactured from a spinning process, not normally for glass containers - with thinner wall and lighter weight. The Glass Bowl is: i) Stain free ii) Tempered (toughened & long lasting) iii) Made for a dishwasher - it dry’s! iv) Odorless v) No leach - Indisputable safety vi) 100% recyclable 2) Patent-pending Membrane i) Air & liquid tight seal (with low compression force) on bowls and containers with wide tolerance ranges, e.g. spun glass, ceramics, pressed-steel. ii) Removable from aluminium lid for microwaving and dishwashing. iii) Air & liquid tight seal on internal divider containers when placed anywhere within bowl. Multiple internal containers can be used or omitted entirely. Different sizes & volume containers can be used without need for multiple or different lids.